Japanese Episode AG 055: "Shinjin Jimu Ridaa Asuna! Ana-Darake no Batoru Fiirudo!?" American Episode 327: "Poetry Commotion!" Satoshi has arrived in Fuen Town! The young trainer wastes no time in finding the gym, where he finds the young Gym Leader Asuna. Asuna's grandfather and the former Fuen Town Gym Leader, Mura, left on a journey three days before, leaving the gym in Asuna's hands. Problem is, the young Gym Leader doesn't seem to know what she's doing! As Satoshi and his friends help her perform such duties as fixing the hole-filled battlefield and finding the location of the gym's Heat Badges, Asuna's grandfather shows up, in disguise, to help his granddaughter out. Meanwhile, the Rocket-Dan spot Asuna's Cotoise and decide to steal it, so they disguise themselves as workers and offer to help Asuna fix the holes in her gym's battlefield. The Rocket trio attempts to steal Asuna's pokemon from right under her nose, but Asuna's grandfather spots them and alerts everyone of their thievery. A battle commences, and Asuna notices that the old man who came to her gym has a Bakuphoon just like her grandfather's. 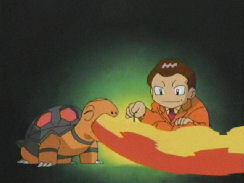 Asuna's and Mura's fire-type pokemon quickly defeat the Rocket-Dan, but in the process Mura's cover gets blown. Mura reveals that he was too worried about his granddaughter to leave on his journey, and Asuna thanks her grandpa for caring about her so much. The battlefield is eventually repaired, meaning that the battle between Asuna and Satoshi can start tomorrow! It's time for the fourth Gym Battle, so we get the obligatory "get to know the Gym Leader" episode. Asuna is one of the more entertaining Gym Leaders we've seen yet, and it's nice to see a Gym Leader who doesn't know everything about what she's doing. We also get to see Asuna's grandpa who, for some reason, gets downgraded to a Gym Leader status in the anime. He was a member of the Shi Ten'nou ("Elite Four") in the video games, yet in the anime he's the former leader of the Fuen Town Gym. It's an odd change, but it's not that big a deal. The dub has an odd cut made, but other than that it's alright. I wasn't too happy when I heard reports that Lisa Oritz was voicing Flannery, but she doesn't do her usual horrible job with the character, so I really don't mind. Bakuphoon keeps its Japanese voice. The "Lavaridge's Hot Spring Hot Cross Buns" that May's eating are called Fuen Meibutsu no Onsen Manjuu ("The Fuen Specialty, Hot Spring Manjuu"). Manjuu are these Japanese-style buns stuffed with a bean paste, and while they're a bit different from the dub's "hot cross buns," the translation works well enough. Flannery: "With almost the whole village there to say goodbye, grandpa was off!" The problem with this line is that Lavaridge Town is just that--a town. Unless Lavaridge got a huge influx of new residents within the last three days to allow the village to be upgraded to a town status, this line is incorrect. In the Japanese version, Asuna just says that everyone gathered together to see her grandfather off. As the Rocket-Dan plot to kidnap Asuna's Cotoise, Nyasu imagines how useful the pokemon would be if they gave it to the Boss. 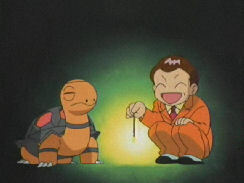 In the dub, Meowth thinks of two uses--to light a BBQ pit and to light a candle. In the Japanese version, though, there's a third use that we don't see in the dub; Cotoise can be used to light a fireworks lighter. 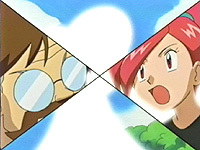 I can't really imagine why 4Kids would decide to cut this out. Are they afraid kids are going to start playing with fireworks or something?